Rip! SL Green and Jeff Sutton continue their collective tear through New York commercial real estate, contracting to buy the Valentino store at 747 Madison Avenue for nearly $65 million, according to Lois Weiss at The Post. The luxury clothier's 10-year lease is up soon, meaning there's an opportunity to raise the rent something fierce. 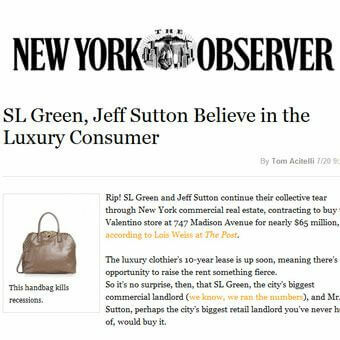 So it's no surprise, then, that SL Green, the city's biggest commercial landlord (we know, we ran the numbers), and Mr. Sutton, perhaps the city's biggest retail landlord you've never heard of, would buy it. It 's all about the handbags on this little island of ours. SL Green and Mr. Sutton have been on a tear of late: Last week, they signed Dolce & Gabbana and Escada to major leases in 717 Fifth Avenue (the Dolce deal might be worth $300 million); and they bought 1552 Broadway for $130 million. Still, the latest deals seem less a capitalizing on a cllastened real estate market than on an abiding faith in luxury retail and the shoppers which power it. Even now, with cats and dogs living together economically: Wall Street is about to see massive layoffs. The city's housing market continues to recover in fits and starts. And the local and national unemployment rates have stayed so relatively high for so long now that Important People speak of a New Normal of near-double-digit joblessness. Will New Yorkers need their $1,995 handbags much longer? Well ... Perhaps two of the city's savvier real estate investors know the answer.